Iowa junior quarterback Nate Stanley has been named to the 2018 Maxwell Award Watch List. The Maxwell Award is presented annually to College Football’s Player of the Year by the Maxwell Football Club. Stanley is one of 11 Big Ten players named to the 84-man list. A quarterback has won the award in eight of the last 10 years. Stanley (6-foot-4, 242-pounds) led Iowa’s offense last season with 2,437 passing yards and 26 touchdowns. 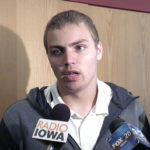 The Menomonie, Wisconsin, native became the only Iowa quarterback in program history to have two five-passing touchdown games in the same season, and his 26 touchdown passes ranked third in the Big Ten last season and tied for the second most in a single season at Iowa. Iowa junior defensive end Anthony Nelson has been named to the 2018 Bednarik Award Trophy Watch List. The Bednarik Award, presented annually by the Maxell Football Club, is given to the nation’s top college defensive player. Iowa has had four semifinalists for the award since 2005, with former defensive back Desmond King being the most recent in 2016. A year ago, Nelson (6-foot-7, 271-pounds) started all 13 games and recorded a team-leading and career-high 7.5 sacks to earn third-team All-Big Ten honors. The Urbandale, Iowa, native totaled 41 tackles, including 9.5 for loss, while also recording four pass break-ups, two forced fumbles, and a blocked field goal. His fourth-quarter strip sack against Boston College quarterback Darius Wade ultimately led to Iowa’s game-winning touchdown in the Pinstripe Bowl.